Camping in Mexico is something to add to your bucket list. There's nothing quite like rolling up on a secluded white sand beach in a Volkswagen van, falling asleep to the Milky Way above your head, and rising to the sound of crashing surf. Pull yourself out of bed and whip up a tasty plate of huevos rancheros as you watch the sun rise over the water. Yep, there's something special about camping in Mexico. But what about logistics? Should you travel by campervan? Where can you camp? How can you ensure your safety? Read on to find out the answers to these questions and more. Which Method of Camping Is Best? 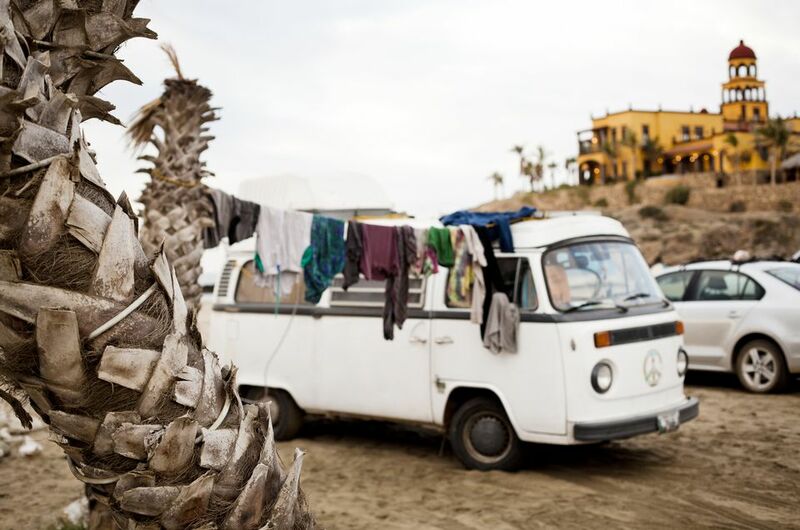 The easiest and safest way to camp your way around Mexico is by hiring a campervan and driving yourself from campground to beach to desert to mountains. This way, you're in full control of where you're going, you can research places to camp before you get there to ensure they're safe, and they're usually much more comfortable options for sleeping, too. Alternatively, you can rent a standard car and pack your tent in the trunk for evenings. You'll be much more open to the weather in this case, and safety can sometimes be an issue, but you'll also be much more immersed in your surroundings. We can't write about camping in Mexico without mentioning this useful Mexican camping page that's full of tips and advice for exploring the country by campervan. The most valuable piece of advice is to ask for permission before camping on private land. Site owner, Jeffrey R. Bacon, writes, "Whenever possible, obtain permission to camp, and practice low-impact camping techniques and safe fire handling practices. Pastors, cowboys, restaurant owners, local travelers, and even squatters have given me and my traveling companions helpful advice and accommodating assurance when we've asked for permission to camp." Pitching your tent for free is great, of course, but as always, it holds pitfalls: If you're on private land without permission, you may be rousted in the middle of the night; if you're hanging your hat on a deserted beach, you may be fair game for predators. Keep in mind that there are dangers everywhere and you'd have to face similar risks if you rocked up to a beach in the U.S. and decided to park your tent there for the night. How Can You Find Campgrounds? Let's assume you're traveling in your own vehicle and would prefer to stay in a campground. If that's the case, be sure to check this out some of the best campgrounds in the country. In fact, some of them are so nice that they're virtually resorts. Mexico is a diverse country -- that's what makes it so amazing to camp in. It does, however, mean that you'll need to prepare for many different weather conditions. You might experience one of the coldest nights of your life up in the hills of Guanajuato, then a week later, you'll be sweating on the beaches in the Yucatan. Make sure you pack clothes for both hot and cold temperatures and prepare for sand, storms, and snow. If you'll be camping in Mexico, it's wise to learn some basics of Spanish before you leave. Even if you'll be planning on spending significant amounts of time in more popular parts of the country, it's useful to be able to communicate and ask for help. Plus, the locals will always appreciate you making the effort to learn some of their languages, even if you mangle the pronunciation. The tap water in Mexico isn't safe to drink, so you should opt to stick to bottled water or use a filter as you travel. The Grayl water bottle for travelers is excellent. It allows you to drink water from any source and not get sick, as it filters out 99.99% of viruses, cysts, and bacteria. Make sure you feel comfortable and understand driving in Mexico. Learn about insurance, Mexican border crossings, and the interesting rules of the Mexican road. Lastly, consider buying Mike Church's Traveler's Guide to Mexican Camping and give it a good going-over before you leave. It covers many basics about camping in Mexico and has an extensive list of RV campground sites, too. Mountains, beaches, deserts -- Mexico is camping heaven.